SB Latex « Global Market Insights, Inc.
With a diversified application portfolio in the automotive sector, global synthetic and bio-based butadiene market is generating a commendable momentum in the chemical industry. The huge valuation of the butadiene market can be majorly credited to its use in the manufacturing of tires. On account of this fact, the expanding tire industry which had a market size of 2.5 billion units in 2016 and is projected to surpass a volume of 3.9 billion units by 2024, validates the strong growth prospect of the synthetic and bio-based butadiene industry over the coming timeframe. In addition to this, the growing vehicle production which was recorded at 90 million units in 2016 is also a strong driving force behind the synthetic and bio-based butadiene market trends. APAC synthetic & bio-based industry to hold a major chunk of the global landscape over 2016-2024Asia Pacific is one of the major growth avenues for the global synthetic and bio-based butadiene industry. Reportedly, APAC led the global industry landscape in 2016 with a contribution of more than 45% of the overall share. China is forecast to predominantly drive the regional revenue having had similar trends over the past few years. As per the estimates, overall automobile production in China was 23 million units in 2016. Moreover, the notion of reducing the weight of the vehicles which further enhances the fuel efficiency and parallelly reduces the carbon emissions in the atmosphere is also significantly impacting the regional dynamics. China reportedly uses a substantial amount of plastic content in the manufacturing of automobile parts, particularly ABS. Estimates claim China ABS synthetic & bio-based butadiene market to record substantial growth over the years ahead having had a valuation of USD 740 million in 2016. The shifting inclination toward biodegradable products is also leading to a dynamic change in the synthetic and bio-based butadiene market outlook. This fact is validated by the growth statistics pertaining to the synthetic butadiene market. In 2016, synthetic butadiene dominated the overall product landscape having had a valuation of USD 15 billion in 2016. However, with the prominent notion of using bio-based products and increasing concerns pertaining to environmental hazards, the synthetic butadiene market will experience a moderate CAGR of 4% over the coming seven years. On the contrary, the sluggish growth of the synthetic butadiene will parallelly increase the demand for bio-based counterparts substantially. Reportedly, Bio-based butadiene market held a valuation of USD 450 million in 2016, a value far less than the synthetic butadiene market. However, the analysis claims the bio-based butadiene industry to register a double-digit growth rate of 13% over the period of 2016-2024. The industry participants are making constant efforts to modify their product portfolios in sync with the environmental norms. In this regard, the firms are investing heavily in R&D to develop bio-based products. 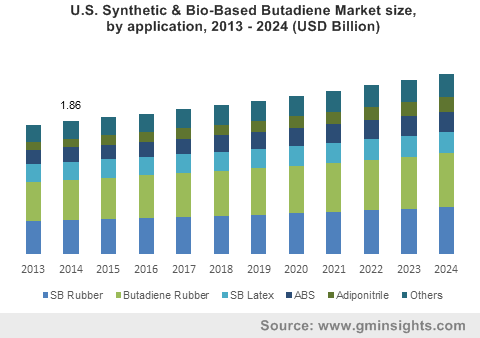 Key participants in the synthetic and bio-based butadiene market include BASF SE, Evonik Industries, Eni S.p.A, INEOS, ExxonMobil, Royal Dutch Shell Plc, LyondellBasell Industries N.V., The Dow Chemical Company, and SABIC. Reportedly, the industry has been quite fragmented over the years with the major players sharing just 30% of the overall business space. Another trait of the synthetic and bio-based butadiene industry is the tie-up of these product manufacturers with the end-use industries such as automotive, construction, etc. where these players get a major exposure to the entire industry ecosystem. The expanding automotive base is certain to provide a substantial impetus to the global synthetic and bio-based butadiene industry over the years ahead. As per Global Market Insights, Inc., this industry is estimated to exceed a market share of USD 24 billion by 2024. The two major trends to watch for in the synthetic and bio-based butadiene market are the escalating growth of the bio-based butadiene products and the challenges they might offer to the synthetic counterparts coupled with the lucrative opportunities APAC will offer to the global industry base. This entry was posted in BIOMASS, BIOENERGY AND RENEWABLE CHEMISTRY and tagged ABS, Adiponitrile, Bio-based Butadiene, Butadiene Rubber, Global Synthetic and Bio-based Butadiene Market, SB Latex, SB Rubber, Synthetic & Bio-based Butadiene Market, Synthetic & Bio-based Butadiene Market Size, Synthetic Butadiene.